Human beings have 5 fingers on each hand. Piccolo is from the Planet Namek so he has 4 fingers. Oh, sometimes he's shown with 5 fingers, but then again this is the same Mr. Akira Toriyama who drew Yajirobe twice on the spine of the covers. Also, Tetsuwan Atom (Astro Boy) initially had 4 fingers. It is well-known that the inspiration for Atom came from early Disney films, and a character called Mickey Mouse. "Because if you animate him with 5 fingers, it looks like he has 6 fingers when he's moving." After that, Atom was drawn with 5 fingers. In any case, fingers are a pretty famous topic in manga, but 2004 saw some strange occurrences: one after another, titles from famous shonen magazines started showing people with 6 fingers. The first to do it was Magazine. The following is a scene from Oh Great's "Air Gear," where Kazu is holding a turd. He's grown an extra finger. What was great about 2004 was that this didn't end quite yet: next, we have Takeshi Kai's "Prince of Tennis." During this time, we saw Mr. Kai's talent in full force as we also had a referee suddenly teleporting to the opposite side of the court, among other incidents. What happens twice will happen a third time. Next up was Sunday, with Takashi Shiina's "Zettai Karen Children." Even Mr. Shiina, a veteran author, fell victim to this phenomena. 6-finger syndrome hit all 3 major shonen magazines...how exciting. 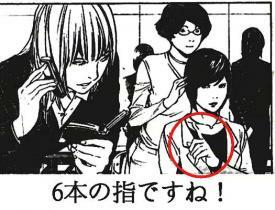 Note: The most recent 6-finger incident happened with Takeshi Obata's Death Note, serialized in Weekly Shonen Jump. Submitted by Kai Master (not verified) on Tue, 2007-03-20 07:03. Weird! I don't like six-fingered hands, that's freaky! I prefer 4-fingered ones, but anyway, if my english is good enough all of this 6-fingered story is a "game"!? ...or do mangaka make mistakes while drawing hands? Submitted by Anonymous (not verified) on Tue, 2007-03-20 14:20. Submitted by Anonymous (not verified) on Tue, 2008-04-29 23:31. I noticed a six-fingered hand on Asuka in (I think) volume six of the Evangelion manga. I don't remember which chapter. This would have been pre-2004.